It’s amazing how easy it is to look back and wonder “what if.” Looking back and honestly assessing your personal history can be helpful if you use the information correctly. The danger is that many people look at the past and then allow their mind to magically and falsely change history. Comparatively, while looking back may be a necessary part of the growing process, it’s important to keep your eyes and your focus on moving forward. Going backwards cannot be an option. No matter how tempting walking backwards and trying to change the past may be, it can’t be done and offers nothing but pain and false hope. You deserve better. You are on a journey and your life is unfolding exactly as it is supposed to be for you. One day at a time as the road continues to unfold for you, your mission is to enjoy it, move forward and continue to grow. 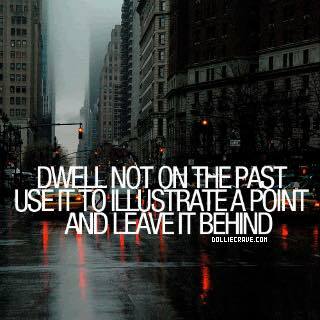 Allow the past to stay in the past. Allow The truth of your history to be a template from which you learn in order to have an even brighter future. Make the most of this very moment and allow yourself the freedom to fully be present. Release the past and embrace the moment to set sail on the most beautiful of futures. The best is yet to come. This entry was posted in Guest Writer, Inner Peace Playground on November 29, 2015 by gordonglantz.